Visually amazing, this critical history of comic books, manga, and graphic novels is a must-have for any comic buff or collector. Over the centuries, comic books and their offshoots, such as graphic novels, manga, and bandes dessinées, have evolved into a phenomenally popular, influential, and unique art form through which we can express our opinions, our fantasies, our nightmares, and our dreams. In short: comics are emphatically no longer just for kids. 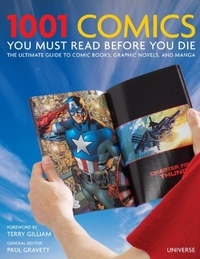 This volume is the perfect introduction to a dynamic and globally popular medium, embracing every graphic genre worldwide to assess the very best works of sequential art, graphic literature, comics, and comic strips, past and present. Packed with fantastic reproductions of classic front covers and groundbreaking panels, this book is visually stunning as well as a trove of information-- perfect for the passionate collector and casual fan alike.